An NTA-free, productive, weakly basic low-foaming cleaner with a decay effect. The product contains glossy, cross-linking, preserving polymers that provide a high gloss and the easy-to-clean effect. Very suitable for biological water treatment plants. nextzett Clean, Dry & Shine is a NTA-free, productive, weakly basic, low-foaming cleaner. It is based on a combination of nonionic surfactants, which in combination with modern dispersants reliably remove oil, animal and vegetable fats, insects, road pollution, protein, and micro dust.Highly effective limescale inhibitors do not produce any lime deposits during drying. Nextzett Clean, Dry & Shine contains glossy, cross-linking, preserving polymers that ensure a high gloss and the easy to clean effect. Nextzett Clean, Dry & Shine is easy to clean and contains neither nitrates, complexing agents (NTA, EDTA) or sodium or potassium hydroxide. This composition guarantees a material and environmentally friendly cleaning. The surfactants contained are very biodegradable according to the guidelines of the WRMG and behave in the waste water environmentally neutral. 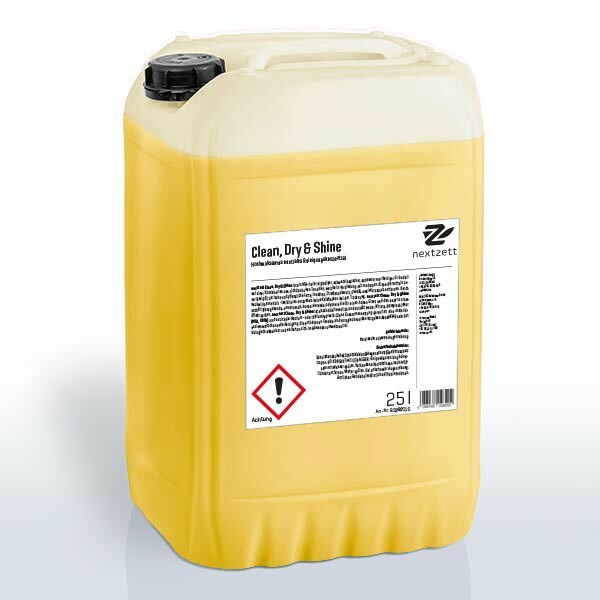 Cleaning concentrate for machine and manual cleaning of painted surfaces, engine rooms, chassis, machines and workshop floors. nextzett Clean Dry & Shine is used in professional as well as in the consumer area. nextzett Clean, Dry & Shine is suitable for use in self-service Vorsprühgeräten, in all Vorsprühbögen of commercial vehicle washes and for manual application in manual spraying equipment.